Weight: 2 - 16 oz. Life Span: 5-12 years depending on species. Food: Insects, fruit, nuts, seeds, tree sap. There are over 200 different species of woodpeckers worldwide, 21 of which can be found in the United States. The woodpecker is most commonly found in wooded regions of the country, where they can cause damage to the exterior of wooden buildings and houses. Pecking or “drumming” against trees or buildings is the characteristic most associated with Woodpeckers. They do this to establish territories, to attract or signal mates and a method of echo-locating grubs under the bark of the tree. Woodpeckers have short legs with two sharp-clawed, backward-pointed toes and stiff tail feathers, which serve as a supportive prop. These physical traits enable them to cling easily to the trunks and branches of trees, wood siding, or utility poles while pecking for food. They have stout, sharply pointed beaks for pecking into wood and a specially developed long tongue that can be extended a considerable distance. The tongue is used to dislodge larvae or ants from their burrows in wood or bark. 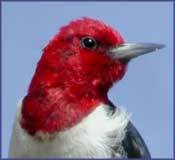 The red-headed woodpecker call is a "kerr-uck, kerr-uck". Hear It Now! The red-bellied woodpecker call is a "churr-churr" or "querr-querr", "chuck-chuck-chuck". Hear It Now! Listen to a woodpecker drumming. Hear It Now! Woodpeckers can be a nuisance in wooded regions of the country, primarily from the drumming sound they produce when pecking at the sides of homes and businesses. This can be quite annoying, especially in the early morning when the occupants are trying to sleep. They can also cause significant damage to the sides of buildings, telephone poles, eaves, fences, etc., by pecking holes into the surface. The holes are usually caused by 1 or 2 birds during the spring time mating season. Woodpecker damage to buildings is a relatively infrequent problem nationwide, but may be significant regionally and locally. Houses or buildings with wood exteriors in suburbs near wooded areas or in rural wooded settings are most apt to suffer pecking and hole damage. Generally, damage to a building involves only one or two birds, but it may involve up to six or eight during a season. Most of the damage occurs from February through June, which corresponds with the breeding season and the period of territory establishment. Woodpeckers can be particularly destructive to summer or vacation homes that are vacant during part of the year, since their attacks often go undetected until serious damage has occurred. For the same reason, barns and other wooden outbuildings may also suffer severe damage. Damage to wooden buildings may take one of several forms. Holes may be drilled into wood siding, eaves, window frames, and trim boards. Woodpeckers prefer cedar and redwood siding, but will damage pine, fir, cypress, and others when the choices are limited. Natural or stained wood surfaces are preferred over painted wood, and newer houses in an area are often primary targets. Particularly vulnerable to damage are rustic-appearing, channeled (grooved to simulate reverse board and batten) plywoods with cedar or redwood veneers. Imperfections (core gaps) in the inter-core plywood layers exposed by the vertical grooves may harbor insects. The woodpeckers often break out these core gaps, leaving characteristic narrow horizontal damage patterns in their search for insects. If a suitable cavity results from woodpecker activities, it may also be used for roosting or nesting. Drumming, the term given to the sound of pecking in rapid rhythmic succession on metal or wood, causes little damage other than possible paint removal on metal surfaces; however, the noise can often be heard throughout the house and becomes quite annoying, especially in the early morning hours when occupants are still asleep. Drumming is predominantly a springtime activity. Drumming substrates are apparently selected on the basis of the resonant qualities. They often include metal surfaces such as metal gutters, downspouts, chimney caps, TV antennas, rooftop plumbing vents, and metal roof valleys. Drumming may occur a number of times during a single day, and the activity may go on for some days or months. Wood surfaces may be disfigured from drumming but the damage may not be severe. All Woodpeckers are protected by the Federal Migratory Bird Treaty Act. One effective control method is exclusion using BirdNet netting that can be installed in a semi-permanent configuration until nesting behavior has been permanently modified. Alternatively, taste deterrents like the Bird Stop spray, combined with audio-visual scare tactics such as WoodPecker Pro Sonic Repeller distress call unit, Bird Bopper Balloons, Prowler Owl, and Irri-Tape have been effective, especially if used when the problem first arises. Shock Tape is also effective at deterring landing. See our complete list below of recommended bird deterrent products to repel woodpeckers. A "synergy" or combination of bird repellent products typically offer the most successful solution for repelling woodpeckers. For bird control solutions, we often recommend using companion products by combining electronic sonic repeller devices or bird hazers with visual scare deterrents, physical bird barriers or scent and taste aversion products. This kind of multi-sensory attack is extremely effective in deterring noisy woodpeckers for good! Woodpecker ProSonic woodpecker repeller uses real woodpecker distress calls to protect your property. Prowler OwlVisual bird scare, predator owl replica is lifelike and moves in the wind to scare away birds and pests.